Berlin, March 14th, 2012 – Native Instruments today announced TRAKTOR KONTROL F1, a pad-based, USB-powered hardware controller built to control the advanced Remix DecksTM in the included TRAKTOR PRO 2.5 software. TRAKTOR KONTROL F1 provides 16 multi-colored, touch-sensitive LED pads, an advanced global control section as well as an ergonomic mixer section including four volume faders and dedicated filter knobs. Designed specifically for DJing, the KONTROL F1 offers a DJ-centric workflow for launching clips in an intuitive way, allowing users to switch between up to 64 tracks, loops and one-shot samples on each deck. TRAKTOR KONTROL F1 includes the full version of the TRAKTOR PRO 2.5 software, also available as a free update to all users of the TRAKTOR 2 generation. Version 2.5 introduces the innovative Remix DecksTM, giving access to a powerful loop suite made up of 64 slots, each able to hold loops, one-shot samples or even tracks. DJs can control up to four Remix Decks at once and save their work as an entire Remix Set with its respective beat grids, BPM and key information in a new file format that can be comfortably imported into a track deck via TRAKTOR’s browser. TRAKTOR KONTROL F1 was designed specifically to control the Remix DecksTM and provides full and tactile control over the new feature, benefiting from seamless bi-directional software-hardware integration and offering full visual feedback through the multi-colored LED pads. 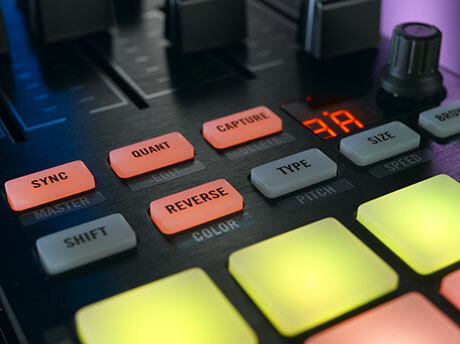 Advanced parameters such as Punch mode and FX assignment can also be comfortably changed from the KONTROL F1 and four smaller pads at the bottom of the matrix stop or mute a group of samples. 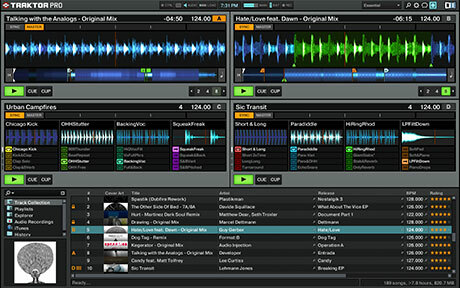 Controlling Sync, Quantize, Sample Size, Reverse and other functionality, the comprehensive global section also features a push encoder to switch through the four pages of the 16 pads and offers a ‘Capture’ button, which allows DJs to grab samples from running tracks of each track deck within the TRAKTOR software, both before and during the actual DJ performance. Each regular track deck within TRAKTOR PRO 2.5 can be switched to a Remix Deck, thus offering dedicated transport, sync and tempo master controls. 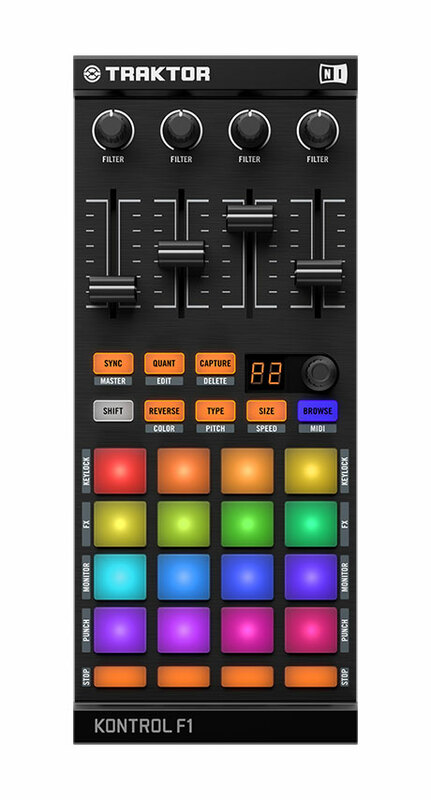 This allows DJs to control an entire Remix Deck via Native Scratch timecode control with vinyl or CDs, or using the jog wheels of the KONTROL S4 and KONTROL S2 hardware. TRAKTOR KONTROL F1 was designed to integrate perfectly into any TRAKTOR DJ setup. With the same form-factor as TRAKTOR KONTROL X1, KONTROL F1 fits neatly alongside standard DJ mixers and the all-in- one DJ systems TRAKTOR KONTROL S4 and S2. The TRAKTOR Bag provides reliable protection for the KONTROL F1 during transport, and also doubles as a solid stand, elevating the KONTROL F1 to standard mixer and turntable height. TRAKTOR KONTROL F1 will be available on May 30th for a suggested retail price of $279 / 249 EUR at authorized retailers and at the NI Online Shop It will ship with a full version of TRAKTOR PRO 2.5. All owners of TRAKTOR PRO 2, TRAKTOR SCRATCH PRO, TRAKTOR KONTROL S2 and TRAKTOR KONTROL S4 will receive TRAKTOR PRO 2.5 as a free update from May 30th. Yep - just like you, I'm impressed, but utterly confused by what I've just seen. If I understand correctly, Native have just shoehorned a more production based workflow into a DJ product. They haven't bridged one software to another, but have approached the idea of loops and samples in a fundamentally different way, one that is very performance based, including scratching. First observation - why didn't they just use Maschine? Well strictly from an operational point of view, Maschine cannot display the different colours, which would make this rather complex workflow impossible. Hence new hardware that is actually easier to transport and tailored specifically for the workflow. So you've got 4 decks, each with a filter knob and volume fader - that much is easy. Beyond that, it's really hard to decipher exactly what Shiftee is doing bar banging a lot of buttons. So let's pull apart the press release to try and make some sense. It seems that what you have is a 4 x 4 block of decks, each with 4 slots for loops, samples or whole tracks. But then the same buttons have secondary functions to enable keylock, control FX, monitor the decks and enable "punch mode". Punch mode allows you to switch to different loops in one group instantly and still stay on beat. And it seems that it's not just about working with prepared groups - you can also "capture" live performances, drop them into slots and use them in exactly the same way. And when you throw DVS control into the equation, what you get is a high powerful but complex workflow. I was lucky enough to see Shiftee perform with the Kontrol F1 at NI's offices in LA this year. I was chatting with various NI people afterwards and since then too, and explained that while the new Remix decks workflow is pretty cool, it is also equally pretty complex and needs a lot of explanation - more explanation that a slick demo video with holographic overlays affords. So hopefully more tutorial based PR will appear, and also less scratchy but more controllerist based demos too. I think I'm only going to understand it fully when I get a blank canvas setup in front of me and start to work through the features myself. Whatever happens, NI appear to have taken a lot of time to think through how DJs are wanting to work. And the end result appear to be not gluing existing applications together, but incorporating the feature where they're supposed to be. Words cannot express the number of facepalms I did when people were convinced that the Kontrol F1 was designed to run with the new Bitwig software, based on little more than bright colours and being based in Berlin. That said, the speech that NI boss Daniel Haver gave us all in LA indicated that NI's 3 product groups will be working much better together in the future. As I keep saying, the lines between styles and genres are blurring. 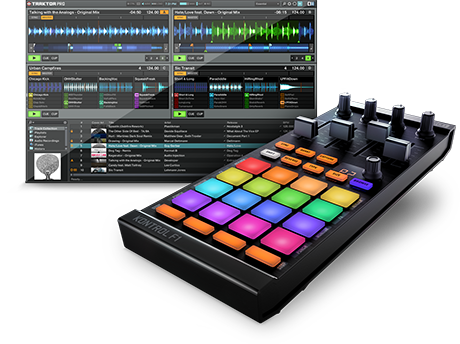 So expect to see more interoperability between Traktor, Komplete and Maschine in the future. It'll be interesting to see how Traktor's competitors react to this. Serato and Ableton's Bridge hasn't exactly set the world on fire. Bitwig shows some promise but nothing in the way of links to DJ apps. The One shows some movement towards production workflows. But the one to keep an eye on is Virtual DJ 8. It's a ground up rebuild and likely to feature Remix Deck style features. Seems that deck A to deck B just got a lot more interesting. Ultimately, I think this looks great - really great - but needs some more explanation first for us to really get our heads around the features and possibilities. 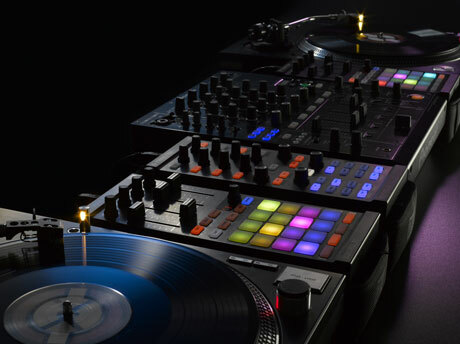 Find out more about Remix Decks here, and about the F1 hardware here. For the hard of reading, the F1 complete with Traktor Pro 2.5 will be available May 30th for $297/€249. And all users of Traktor Pro in its various forms will get a free upgrade. Well that's one common internet moanfest avoided right there. THIS JUST IN: If you want a chance to win a spanking new Kontrol F1 and be the envy of your friends who have to wait until it hits the shops, simply follow this link to the Traktor Twitter page to follow and retweet. lol, moanfest is right. i broke one of my cardinal rules today and popped into the NIforums... right away it was post after post of people bitching about an upgrade fee they didn't even know would happen or not. lesson learned, i won't be going back anytime soon. i admit, i'm pretty impressed with things so far... although still a bit uncertain of what exactly to expect. unfortunately i will not be one of those first in line for the F1, rather i think i'll play with my free update and see about linking it to one of the pad controllers i already own (including Maschine). the F1 will ship with a full version auf Traktor 2.5 and every T2 owner will get 2.5 4free. But if i already own T2, got 2.5 for free, will there be any way to buy the F1 WITHOUT Traktor 2.5? Praise unto the highest - it's about time something like this was available! Question though: The loops and samples will presumably sync to the main track you're playing, via a beat grid. So.....the tightness of the whole thing relies on how accurate that beat grid is. Is there some sort of Ableton Live style warping available, to straighten out wayward tracks? If not, layering loops to an offbeat grid isn't going to work well. Now just add video support to Traktor it's on. Seriously nice design. It deserves to be more successful than the Bridge based on that alone. Will version of traktor it comes with be a scratch version? @Groovin: It almost certainly won't have warping. That would be a HUGE deal for NI to include and wouldn't come with a middle ground update like this. That would be in a new version. @Patrick: It's probably going to work just like every other upgrade. If you have Scratch enabled through a dongle it'll work just fine with the F1 features. If you don't the F1 probably won't enable Scratch functionality. I'm also a little bit badaffled from the vid. I've studied it a few times now and there ain't a great deal going on can't already be done in Traktor, that said, the new workflow looks to make stem/sample triggering a million times easier than it is now. Looking forward to more info on capture, punch and how these sets are going to be shoe horned into the browser. @Rob Krabs - Bundling a full copy TP 2.5 with the F1 gives NI more leg room to charge as much as possible. Software development/support is costly, including a copy of Traktor isn't (but "is" certainly profitable). eBay will probably get flooded with current TP users selling there unwanted copy's of TP 2.5, meaning NI continue to expand there user base. @GroovinDJ - EVERYTHING surrounding fx, samples and sync requires tight grids. NI made promises a good year back that there working warp/stretch for Maschine and they will not release it till its awesome. It could be Maschine big upgrade this year, who knows. Once it's ready I'm sure it'll be shared with Traktor. @J.J - The capcha password has a very short life before it changes, always copy your text and refresh page to gain latest password before commenting, amazes me how many people get itchy vaginas over something so obvious. it makes perfect sense for the F1 to include the free software update since it's purpose built for it, and for first time buyers it gives an easy in to the "Traktor World" without having to worry about paying extra for a full upgrade. as for Scratch mode... i wouldn't expect it to be included since the F1 doesn't offer deck inputs to process the required timecode. not certain if users will be allowed to sell the extraneous software license separately, but i do hope there's little issue in allowing another user to register it.. obviously i won't need it but my roommate could have it. Wow... That absolutely blows my mind with the sheer possibilities it unlocks! Pretty neat. If I didn't know Serato in my sleep (and have custom [-12%] vinyl cut) I'd be looking at it pretty seriously. I know it's not the same as having it all in one application and the color-coordinated control sure is nifty, but it bears mentioning that Ableton has done the "Punch Mode" thing since 2003. Ableton's is called "Legato Mode" and it's more flexible but I'm guessing less integrated. Like most things with software, it's a game of tradeoffs. At the risk of sounding dull, what about the other new features in 2.5? Improved BPM Detection is the only other update I can see on the NI site, although I swear there was mention of improved iTunes integration earlier today - has this been taken down? This is one area I was really holding out for an improvement - being able to organise everything in iTunes and play directly from its library rather than having to continuously import songs to the Traktor library and update playlists is a feature that I miss from using Serato Scratch/Itch. i agree that we need a more 'hands on' routine to truly understand these new features,but im sure they will have an actual 'dj shiftee tutorial' on you tube soon enough.so far,all i comprehend is that you can trigger something like 64 samples in one song?...as opposed to just 8.?..we will see,i would actually like to own one,i enjoy layers for intros and mid-tros and outs-i have an x1,so this is like the x1 for t-2.5 it seems. You can already do this with the A&F Xone K2 But this is a welcomed edition. now will this REPLACE the X1 or work along side, since I don't see any play/cue buttons? Or do I just not see where they are? Another button-box...yay. A very powerful button-box yes(maybe a little overkill?) but, I wish NI could deliver the obvious feature upgrades that get asked for most often ie.) flexible beat-grids,stackable waveforms and user configurable GUI. Doesn't seem like these features would be nearly as difficult to develope compared to something like this F1. Do little coloured sample names really float ethereally into the air when you press the pad? I CALL FALSE ADVERTISING IN THAT VIDEO. "and for first time buyers it gives an easy in to the "Traktor World" without having to worry about paying extra for a full upgrade. That's especially true for Ableton users who are tempted by the rmx decks, it's certainly a great deal for peeps new to Traktor, but I wouldn't be surprised if the lion share of F1 customers will be existing Traktor owners who would probably prefer a cheaper software less avenue to the F1. "not certain if users will be allowed to sell the extraneous software license separately"
Why not? flooding the secondhand market with cheap copies of Traktor means more users. I had no problem shifting the free copy I got with my Audio 10 and selling the copy I got with my S2, made the current S2 deal even sweeter. NI is a very intelligent business machine, every major update Traktor has seen since the X1 has been about cornering a particular aspect of the market and or bettering rival software features. Yes many users like P K above are frustrated, but tweaking features won't grow your user base in the same way major feature updates will. NI are marching down there "road map" pinching the best aspects of rival software features, it's only a matter of time before video, audio warping and a more configurable GUI join Trakor's lengthy feature list. Good business isn't just about making the right moves, it's making the right moves in the right order.